How to Use Missinglettr - Why do most of my posts use the 1st time slot? All Categories ​>​ Campaigns ​>​ Why do most of my posts use the 1st time slot? Each of your sites will have its own time-slots defined. Continue reading to find out why you'll often just see one of these being used. You've setup time-slots for your site, and specified your preferred time-zone. Fantastic! But what now? And how are these slots used? Even though you have setup 4 time-slots for Missinglettr to use, you'll typically find that (in the early days at-least) only the 1st slot will be used. The reason for this is that those slots are there to be used, but only if we need to. Remember, by default, each of your Missinglettr campaigns runs for 12 months and is made up of 9 posts. These 9 posts are sent just once... meaning you literally get 9 posts going out over that 12 month period. For that one campaign, you have one post on day 0 (put differently: day 1), another post on day 3 and so on. When we schedule each of those posts for you, we first check to make sure there is availability on that day. In any given day, a maximum of 4 posts will be sent out. If there are no other posts scheduled on that day, then we take the first available time-slot. 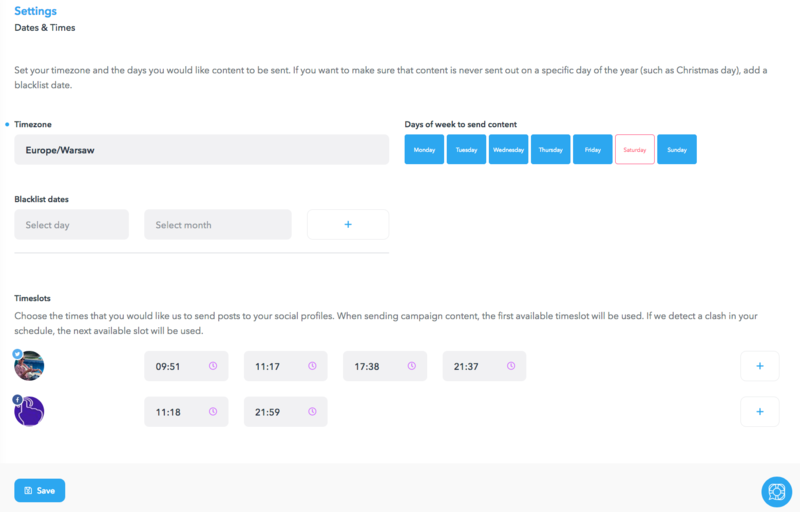 When you first start using Missinglettr, until you reach a certain volume of active campaigns, the majority of the posts we schedule will end up using the first time-slot on the day it is due to go out, simply because there are no other posts going out on that day. As you start approving move campaigns, you'll start to see time-slot 2, 3 and then 4 being used. Remember, Missinglettr encourages natural, non-spammy social posting. It's generally a good thing for your audience that gradually build up the volume over time.